TLDR: We found existing plain text accounting tools unsatisfactory, so we developed Transity. It models financial flows in terms of transactions and not debited / credited accounts. Furthermore, its journal format is based on YAML and can therefore easily be processed by 3rd party tools. It's written in PureScript and published under a ISC license. At Feram we love good CLI tools. For many tasks a CLI tool is just as good as, or even better than a GUI. CLI tools also have the advantage that their developers don't have to waste their time building and maintaining a useless GUI, but can instead use the time to improve the tool itself. One tool we've especially come to rely on is Ledger and it's unofficial successor Hledger (called "ledger-likes"). Over the last year we used them regularly to track and manage our finances. And while they served us well, we always felt that their way of modeling transactions was somewhat unintuitive, complicated and even incomplete. The main problem is that existing accounting tools are historically based on the notion of an account. You add money (debit) and you remove money (credit). If this sounds backwards to you, read this explanation. For example you first get 50 € from Anna and then you buy some food for 20 €. In order to simplify adding up the values with pen on paper (! ), accountants started to use separate columns for debit and credit. Simple, but also incomplete. Where did the money come from? Where did it go? This led to double entry bookkeeping. Whenever you add some money to an account you have to remove the same amount from another one. But you must never forget a posting, cause otherwise your accounts won't balance. If this looks (and sounds) confusing or too complicated, you're not alone! It made sense in former times as this layout makes it easier to add up the amounts by hand, but not in times of computers. So how can we simplify it? It's actually quite easy: We just have to model it in terms of transactions, and not accounts. Together with some further changes it yields a easier understandable, more robust and more complete representation of accounting! Now that we've clarified the theoretical concept, how is this implemented in the field? Ledger-likes as well as Transity use a journal file to capture all financial data. This means if you want to model the finances of several entities simultaneously, e.g. your finances, your partner's, your children's and your company's, you'd have to create a own ledger file for each entity and duplicate the entries. In Transity on the other hand, one simply needs to change the owner: john to owner: anna or use a CLI flag to change the viewpoint and Transity automatically changes the output accordingly. This feature is still in development and only partially included in the latest release. But what if the expense is part of another category as well, like expenses for your vacation? Well, you'd be at a loss. There is no good way to model this in ledger-likes without getting really hacky. In Transity, however, accounts and tags are separate fields and therefore you can simply assign tags to transactions to capture the category. You could for example assign the milk commodity a default food tag and assign a vacation tag to the particular transaction. Please be aware that filtering by tag is still in development and only partially included in the latest release. Due to the extensive modeling of the transaction, you don't even need a description for it. A "Buy milk" note would not contribute any additional information. Ledger supports a special output format which can be piped into Gnuplot to visualize an account balance over time, but you need to know the intrinsics of Gnuplot to use it. Hledger has its own Web UI, but it's not packaged with Hledger on all platforms per default. 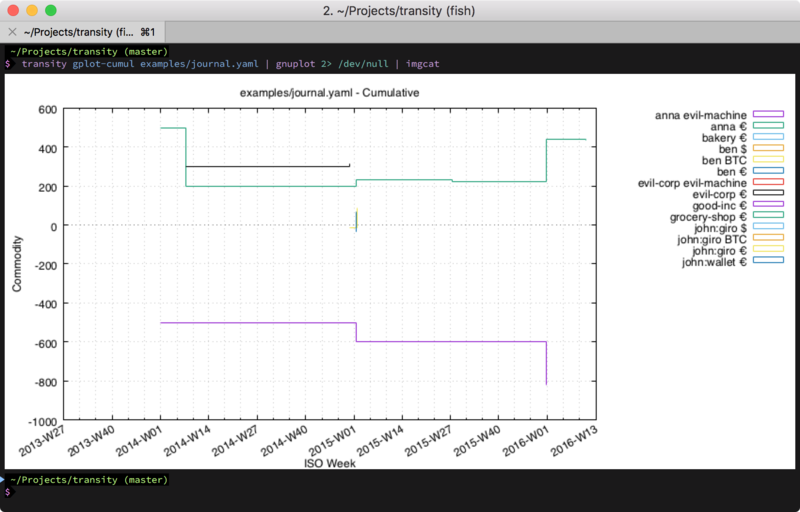 Check out the plotting documentation for more examples. This were the major differences of Transity to ledger-likes. There are, however, several more, like e.g. high precision timestamps. For a complete list of Transity's features make sure to check out the GitHub page. PS: I'll also be at the ZuriHac 2018 in Zürich at the end of the week and work on Transity. If you happen to be there as well, you're welcome to join me!